Alex: Any excuse to make a trip to the Hunter Valley and Team FFS will jump on it. We’ve always appreciated a glass of vino and perhaps that’s because we’ve grown up with and thankfully still get to have our Nonno’s home made wine. After the two hour drive and feeling as though I had withered away to nothing we left it up to the chef to pick our lunch options. This is at times a risky thing to do, but a move that we tend to make often in order to try a range of different things on the menu. 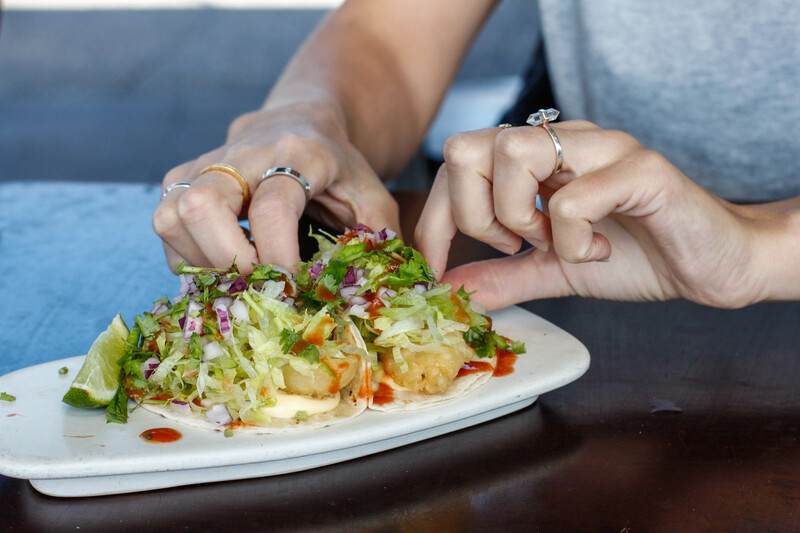 We started with the Flathead Tacos with iceberg lettuce, spanish onion, coriander, habanero mayo, hot sauce and lime $6 each. Very similar dish to Publica Group’s sister restaurant Henrys in Cronulla. A great acidic kick that was enhanced by the hot sauce. The fish was battered lightly and had a great flavour but we did find that the tacos were packed with too much lettuce. Perhaps a little less and it wouldn’t have been as much of a mess to eat. We noticed others diners eating the tacos and having the same issue. 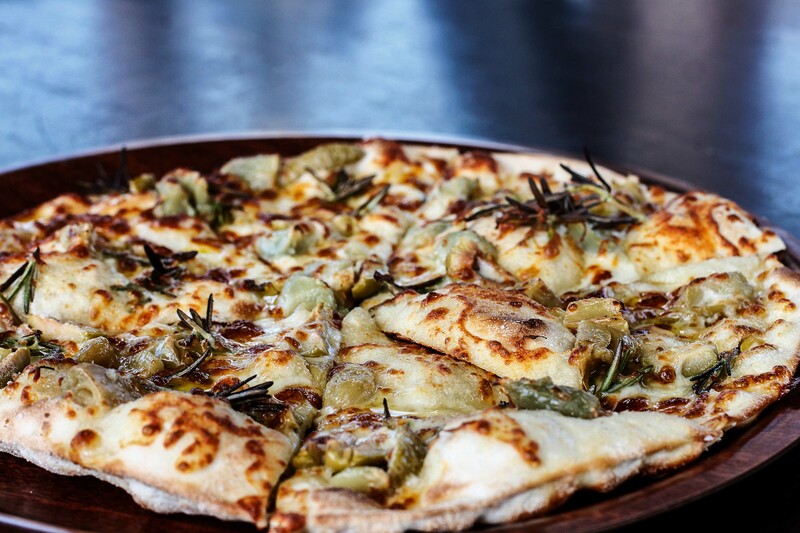 The only option on the menu that we requested was the Flatbread pizza with confit garlic, rosemary, green olive, mozzarella and sea salt $16 because…bread. Ever since starting F45 a few months back we’ve become heavily addicted to the carbs, who even knew that was possible. I loved the addition of the olives and the overall seasoning of the pizza was fantastic but it was unanimous that it was just way too oily. Making it quite sickly to eat after a slice. Not something we would generally order, which is why we enjoy letting the chef pick the dishes was the wagyu beef carpaccio with black garlic, truffled pecorino, cured egg yolk, mustard cream and watercress $24. The carpaccio had a nice velvety texture but the black garlic was relatively overpowering and the large granules of salt were a little excessive. Probably one of our favourites of the day was the Hiramasa Kingfish crudo with green chilli nahm jim, pickled cucumber, Crème fraîche, rice crisp and nori salt $23. The fish was absolutely beautiful and just melted in the mouth. There was lots of zest from the fish that I thoroughly enjoyed and the rice crisps gave a nice contrasting textural element. As the winds were quite strong that day making it quite chilly outside we decided to get something a little warmer then what we had previously eaten so we went with the Potato Gnocchi with tiger prawn, chilli, garlic, heirloom tomato, basil and pangritata $36. Firstly, the gnocchi itself was absolutely delicious. I had to give my compliments to the chef because they were cooked so perfectly and could easily compete against some of the best gnocchi dishes I’ve had in some quality restaurants in Sydney. I think what let the dish down was the flavours of the tiger prawn being way too overpowering and not reaching a suitable balance between each element on the plate. I did love the addition of the crispy pangritata. Yet again they’ve cleverly created some good contrast in the dish. Being the dessert fiends that we are, a serving of the Vanilla Yoghurt Semifreddo with strawberry whip, poached rhubarb, candied fennel and white chocolate $15 was brought to the table. The rhubarb was not too tart and there was a richness from the ice cream that I enjoyed. White chocolate tends to be my least favourite type of chocolate but it was beautiful against the flavours on the plate. A much lighter way to finish off a meal. There’s no denying that the Hunter Valley has a great selection of dining options, so if you’re after something a little more casual and fun when you’re touring the Hunter Valley but still being able to eat quality food than Goldfish is definitely one to add to the list! And then afterwards you can make a pit stop into the Hunter Valley Smelly Cheese Shop and stuff your face some more like we almost did! For Food’s Sake dined as a guest of Goldfish Bar & Kitchen. All opinions, however are our own. Great review and stunning photography Alex. I really loved the plating of the Gnocchi and the Semifreddo. Glad you guys had a great time on your trip! The food looks great! And we don’t get to the Hunter often enough!